Q) How did the mountain men know when and where to meet for rendezvous? A) In general, the fur company(s) agreed on the next year’s rendezvous site before the supply caravan returned east, however the question touches on how the business communication of the Rocky Mountain fur trade took place throughout the year. As American trappers got to know the Rocky Mountain West, they had in their mental maps the sites that had the grazing, game and space requirements to support hundreds of trappers and Native People, and their thousands of horses. Rendezvous sites were often where two well-known rivers met, or a recognizable point in a valley. They were in what is now Wyoming, Utah, and Idaho and all but three were west of the Continental Divide. The confluence of Horse Creek and the Green River, near Pinedale, Wyoming, was the site of six rendezvous, more than any other place. Today’s rendezvous, more social than historical, are usually not held in places that saw an original gathering. Most years the company officers and field leaders would choose the next year’s rendezvous site before leaving the current year’s rendezvous. As the brigades and free trappers scattered at the end of July, they would have a rough idea of where everyone else would be operating, wintering and gathering the following summer. Summer rendezvous was followed by the fall hunt. When the winter ice locked up the streams and ended the fall trapping season the mountaineers would gather in winter camps known as winter quarters. By this point in the year company field leaders would have an idea how successful the year was going to be and have a list of particular trade items as well as the amount of goods that would be needed the following summer. Letters and dispatches communicating this to the company headquarters in St. Louis would be given to curriers who would make the mid-winter journey to Missouri. 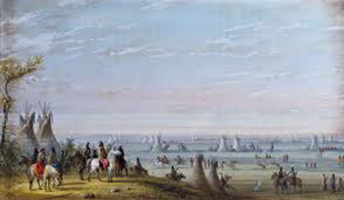 This winter express, as it was called, had to reach the company by a previously agreed upon day, typically in March, to allow the company enough time to collect the goods, livestock and men to haul the needed merchandise to the upcoming rendezvous. As the weather warmed with summer, company brigades and groups of free trappers would start to congregate at the pre-agreed rendezvous site. The expectation was that the supply caravan would arrive from Missouri in the first weeks of July. When the goods arrived, two weeks of trading and partying would begin, then the cycle would start all over again. A location could be chosen late in the trapping year, or changes could be made, and this had to be communicated to brigades in the field. In 1825, William Ashley had not yet decided on the site of the first rendezvous, but he told his trappers where he would leave a mound of earth topped by rocks painted red marking where he would bury directions to the site once he chose it. In spring of 1838 the site of the rendezvous was changed from Green River to east of the Continental Divide near the confluence of the Wind and Popo Agee Rivers. The point of this change was to stay out of reach of traders from the British Hudson’s Bay Company by holding the rendezvous in US territory. Notice of the change was written in charcoal on a storehouse cabin door at the Green River site to tell any trappers arriving there to go over to the new site where they would find, “…plenty trade, whiskey, and white women.” The White women were missionary wives, and a novelty in the mountains.